I created this demo to show my beginning watercolor students an approach to painting using negative space that can be helpful in simplifying complex compositions, building layer by layer from light to dark. I forgot to stop and take a picture at step 1, so the above image as part way into step 2. For the first step, I sketched ovals that approximated the size and position of the flower heads of the dandelions. Then I painted a very light wash into the negative spaces around them. After this layer dried, I sketched in the stems (the next lightest and closest things to the flowers) and begin to paint a slightly darker wash around them. Above is the finished 2nd layer. The wash isn't completely even everywhere, but it's ok. Using an even darker tone, I start to go into the smaller sections and carve out more negative spaces around the leaves and grass blades. At the same time, I start taking negative spaces out of the round flower shapes to start to define the petals. Continuing to go section by section allows me to reduce the chaos of many details into smaller manageable pieces. Starting with big shapes before moving on to smaller shapes simplifies the process. In this photo you can see I'm also starting to work on some of the details in the positive shapes of the flowers. This is where I stopped my demo, but more could be done if desired. One could add endless amounts of detail on top, darker values, and smoother transitions. For example, the stems could have a graduated effect, going from lighter near the flower to darker at the base. 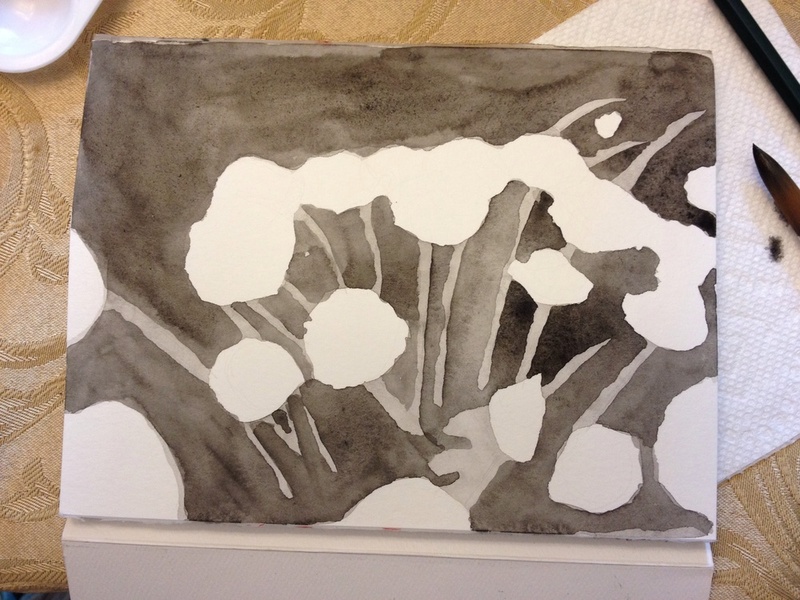 If I had done this sketch in color, I could have started with a light yellow wash over the whole paper, and built up darker and darker washes of green for the foliage behind the flowers. Perhaps I will do that next as another quick watercolor demo.